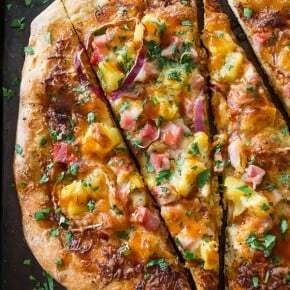 This bbq Hawaiian pizza is the perfect use for all that leftover ham. Tangy bbq sauce topped with melted cheese, red onions, pineapple and ham. 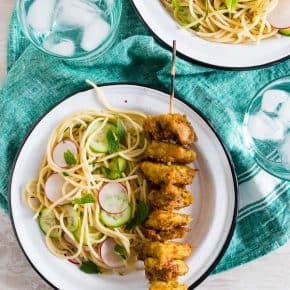 You’ll love how easy this is to throw together PLUS it’s ready in just 25 minutes! I just bought the most ridiculous pair of shoes. They are teal, pink and neon yellow AND they are jelly. You guys – they are the shoes of my childhood. I remember when I was a little kid I would ONLY wear my jelly shoes (with sparkles) and cried the day they broke. I was 4 so I didn’t really get that they were plastic and probably wouldn’t last forever. Since it’s still a bit cold to be running around in jelly shoes I’m staying indoors eating pizza. I already don’t have a bikini body so no need to work on it during the winter. I’ll happily stay indoors eating till I burst. 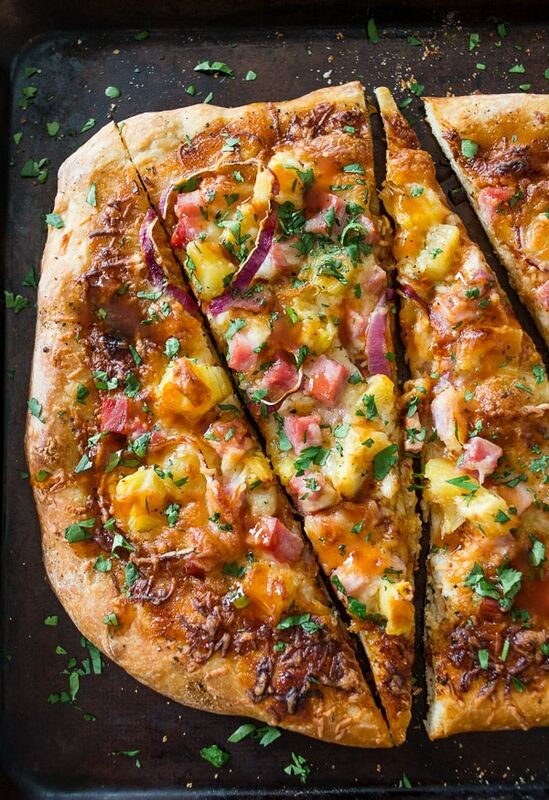 You all know I love a good pizza but this bbq Hawaiian pizza is REALLY packed full of flavor. Instead of the normal tomato based sauce I used tangy bbq sauce and then topped it with melty mozzarella cheese, smoked ham, fresh pineapple, red onions and a sprinkling of cilantro. Plus it’s one of the best uses for leftover Easter ham. I know that each and every single one of you fine folks have 5 pounds of ham sitting in your fridge. Use it up my friends! If pineapple on your pizza isn’t really your thing I have a few other pizzas that just might float your boat! Try my roasted garlic chicken pizza, Parmesan prosciutto pizza, chicken souvlaki pizza or my ratatouille pizza. 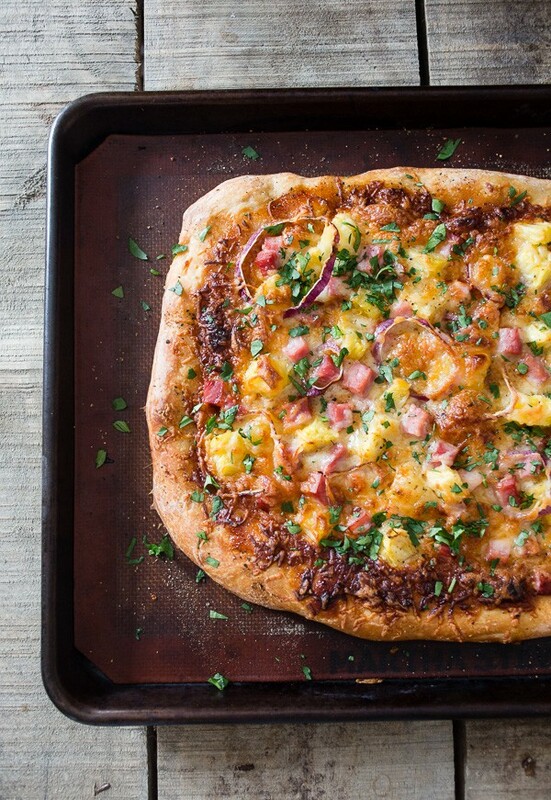 This bbq Hawaiian pizza is the perfect use for all that leftover ham. Tangy bbq sauce topped with melted cheese, red onions, pineapple and ham. 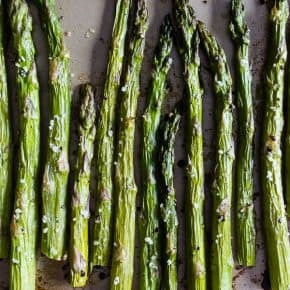 You'll love how easy this is to throw together PLUS it's ready in just 25 minutes! Spread the bbq sauce over the dough leaving a 1-inch from the edge clear of bbq sauce. Top with 1 cup shredded cheese, diced ham, diced pineapple and sliced red onion. Top with remaining 1/2 cup cheese and lightly kosher salt and pepper the crust. Add to the oven and bake for 15-20 minutes or until the curst is brown and the cheese is melted on the top. Once fully cooked sprinkle with chopped cilantro and extra bbq sauce if desired. My sister is sure going to regret going vegetarian now! This is HER pizza! And where are the shoes?! You forgot to upload a picture. The pizza looks awesome but we need to see the shoes. I remember those jelly shoes. They were so cool! Just like this pizza. I love BBQ sauce on a pizza. Jelly shoes aka personal foot saunas 😂😂 This pizza looks fabulous – LOVE that you used bbq sauce instead of tomato! 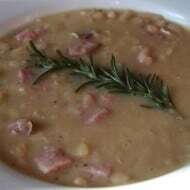 Why didn’t I take leftover ham from my parents to make this?! Damnit! JELLIES!!!! I love a great jelly shoe <3 AND THIS PIZZA! The shoes don’t exist unless there is a photo of them!!!! I LOVE everything about this. Your photos are gorgeous too! I’m loving your pizza! It looks so delicious…the toppings are awesome and homemade pizza is the best! As a matter of fact, I DO have about 5 pounds of leftover ham in the fridge…and this pizza is totally calling my name. I love Hawaiian pizza, so I’m totally craving this now. And ohemgeejellies! 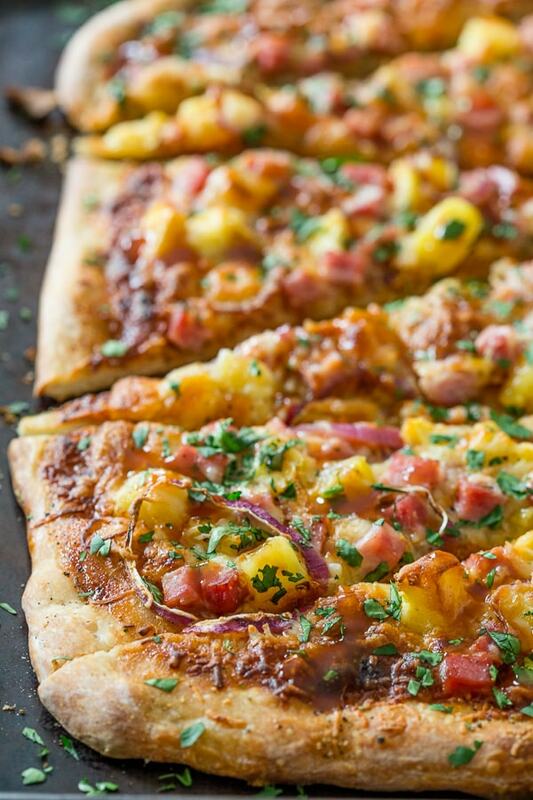 Barbecue chicken and Hawaiian pizza have always been two of my favorites – I love how you merged them together! Such delicious, gorgeous photos of this damn good pizza! I am so inspired. I feel like making Hawaiian all the things! Now I really wish I’d made ham for Easter!! 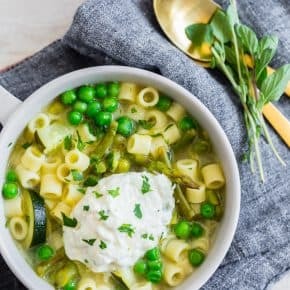 🙂 This looks delicious – definitely on my must make list! a delicious and creative pizza, yum! 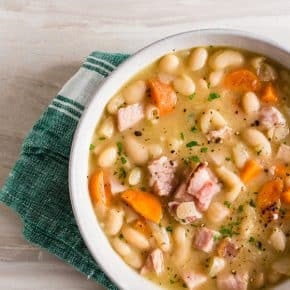 This is just a fantastic way to use up left over ham! We always just end up eating leftovers as they are but I love this idea. Thomas LOVES pizza so I know he’d be ok with this. (I’m pretty sure that he’s made of 99% pizza haha) Oh my gosh and jelly shoes, WHAT!!! I use to have a pair of blue glitter ones that I WORE EVERYWHERE! This is such a beautiful pizza! I love the pineapple/ham combo! I’ve never put BBQ sauce to my Hawaiian but it does sound good. 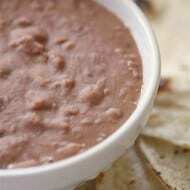 I do add roasted macadamia nuts, coconut and some Swiss cheese to my rendition. 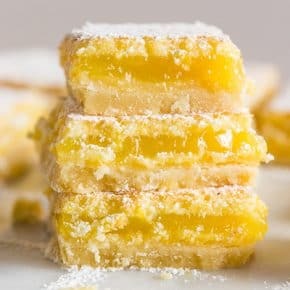 I’m actually making one tomorrow night, the dough is in the fridge “resting” as I write this! 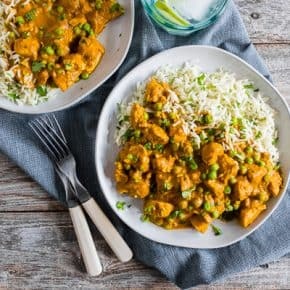 Oh my, this looks so tasty! 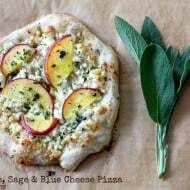 We have pizza every week at our house, and I can’t wait to try this. I even featured it on my blog, her-happy-home.com.